Ours was full of things to do around the house. the first clean up of the year. After the long winter we had, they sure needed some help! Can you believe our crape myrtles are already covered with brand new leaves? And the knock out roses are in full bloom! Before we start this party, lets take a look at last week features. 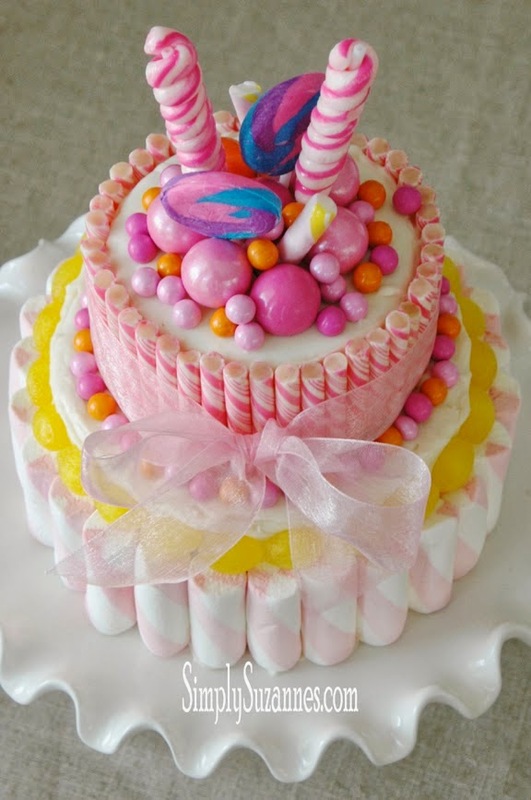 Suzanne from Simply Suzanne's at Home made a gorgeous birthday cake for her little girl birthday. 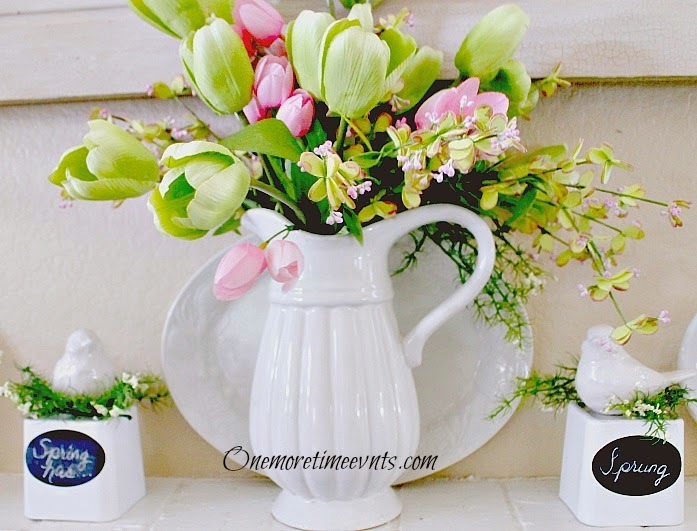 Tammy from One More Time Events decorated her mantle for Spring just beautifully. Love the color scheme and the way it all looks together with the boxwood wreath. 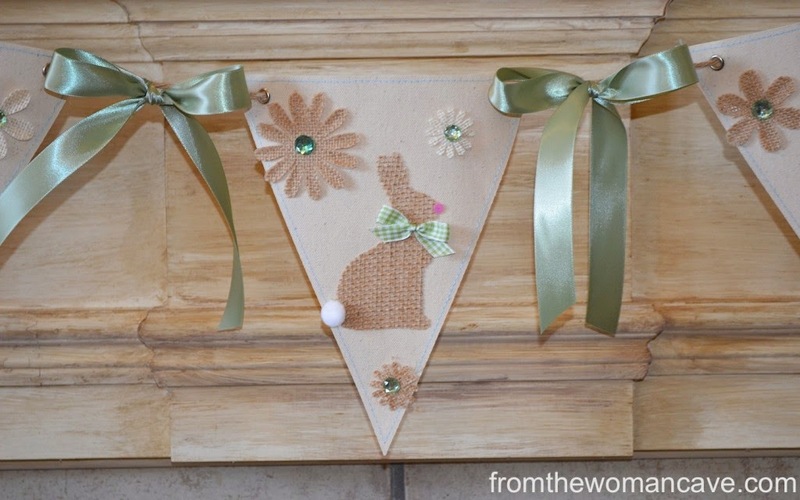 a beautiful Spring burlap banner. This is such a pretty project! Jody from Southern Seazons gave a look at her beautiful porch Spring decorations. Love the color combo and the rug is gorgeous! 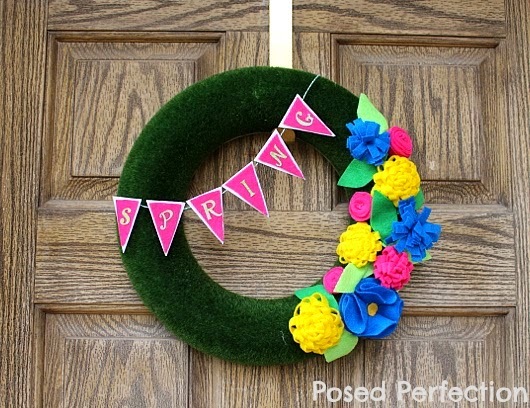 Nici from Posed Perfection made a beautiful Spring wreath. So pretty and original. Love the felt flowers! 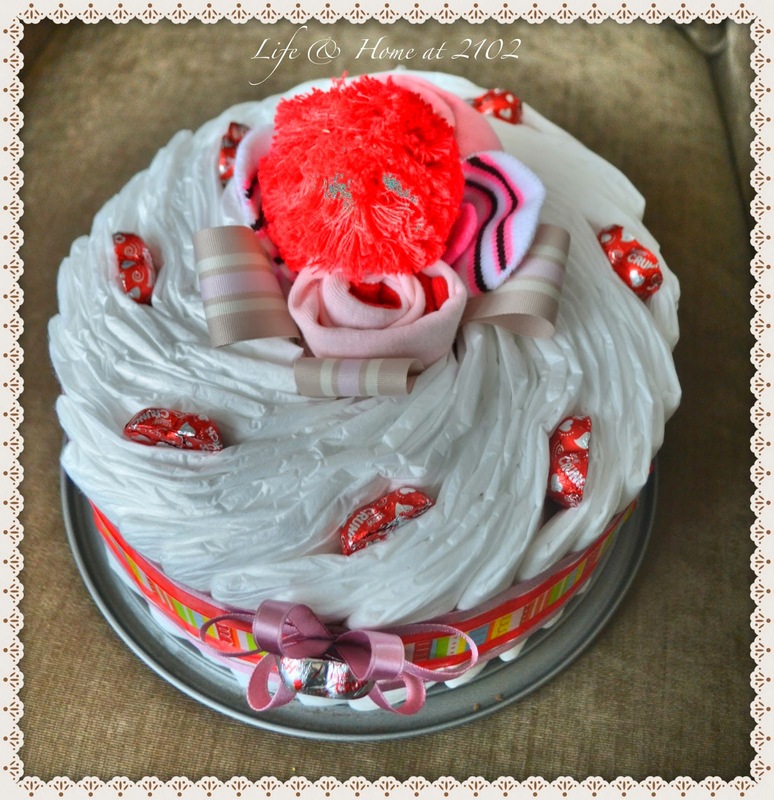 Vel from Life & Home at 2012 linked a tutorial on how to make a diaper cake. This is a beautiful idea for a baby shower gift or just to give to a friend that is expecting. Thank you, again, to all who took the time to participate! I always appreciate your visits! Can't wait to see what you have been up to this week. 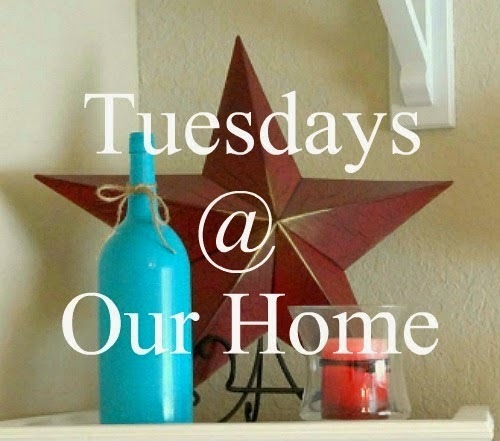 Welcome to Tuesdays at Our Home #54! And there is no rules to join. Just have fun! I have been meaning to write this post, but getting some pictures taken has been a little difficult. Our weather is so unpredictable. One minute is sunny and the next is pouring rain. Anyway, the pictures on this post are not that great, blame those little "talking clouds", but here it is. 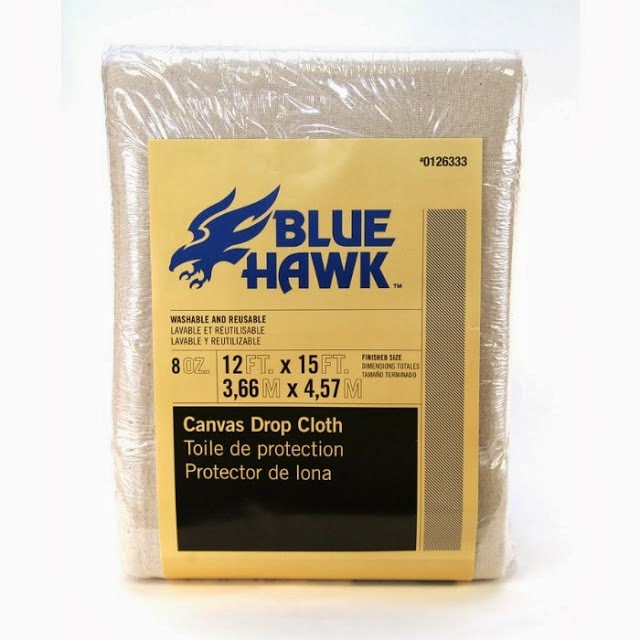 I bought this outdoor fabric last year at the end of Summer sales at 90% off, so I paid like close to nothing for it. Next to the bench I just have my little table with the old white lantern and a small runner I made with the leftover fabric, to which I added a cute little stitch. By the front door, you will find the old planters that I painted using "Mirage" by Valspar. This color is very similar to Annie Sloan "Duck egg". And on the door, the wreath you all have already seen on my previous post. I added a few yellow flowers to it at the last minute. Thank you all for stopping by and, once again, excuse the quality of the pictures. 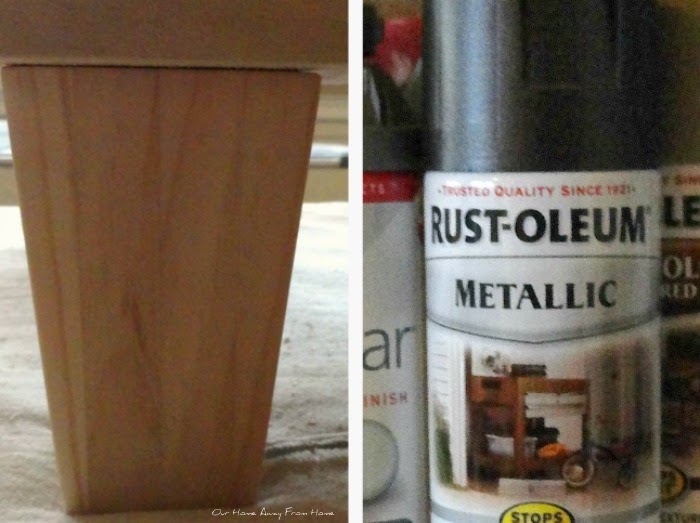 Today I am sharing with you one of the projects we made during Spring Break. A new ottoman for our master bedroom sitting area. This was a very easy project. While they were drying, we got busy building the frame with scrap wood we already had in the garage. When it was finished we added thick foam for the seat and cover the whole frame with batting. We used some left over drop cloth to cover it. I did wash it first and iron it to make it softer. After taking some measurements, I sew the four corners to match the size of the frame. We stapled the fabric underneath. bronze color as the ottoman legs and used it to display some of my favorite books. And that's it! A simple project to finish our little sitting area. Total cost of this project was $40.00 spent in buying the foam, batting and nail heads. Now, I think the area needs a new chandelier. Tuesdays at Our Home is still live. 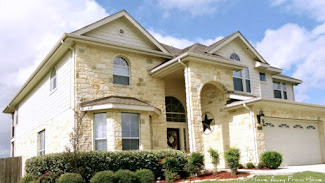 Stop by for a visit or link your favorite project.